Pace University believes your college experience should be more than the number of credits required to graduate. It should be a combination of strong academics, real-world experiences, and mentorships that guide you toward becoming successful both professionally and personally. That’s why we created the Pace Path. With more than 100 majors and accelerated bachelor’s-to-graduate degree programs, Pace offers everything from Biochemistry and Business to Computer Science, Psychology, and Teaching. Our small class sizes—20 students on average—allow for personal attention from faculty who support student success. We are committed to providing multiple opportunities to practice what you learn with internships, faculty-sponsored research, academic and professional competitions, school-sponsored projects with outside firms, community-based projects, and study abroad. At Pace, you can build an impressive résumé before you graduate. A Pace education also extends beyond the walls of the classroom with a variety of cultural events available on and around both campuses, student organizations, and leadership programs—all of which give you the opportunity to grow as an individual. We offer two campus locations—in the heart of New York City and in nearby Westchester County. Our New York City campus is your home base for living, studying, and working in the most dynamic city in the United States. 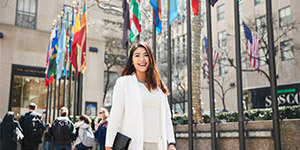 The city is your campus, with cultural and professional activities, learning opportunities, and internships at places like the Federal Reserve, Microsoft, Lincoln Center, the New York Stock Exchange, and many more. Programs exclusive to this campus include Performing Arts, Forensic Science, and Arts and Entertainment Management. At our newly renovated Westchester campus in Pleasantville (just 34 miles from Manhattan), you can enjoy two sides of New York: the quintessential college campus lifestyle and easy access to all of the professional activities and entertainment the New York metropolitan area offers. You can intern at world-class companies in the city and those located closer to campus. Programs exclusive to this campus include Nursing and Communications (Video, Digital Journalism, and Public Relations). The Pace academic experience prepares you for real-world success. You’ll never lose sight of your end goal—your professors won’t let you. They’ll push you to excel beyond your own expectations. They’ll challenge you at every turn to think, feel, experience, debate, and listen. They’ll be your sounding board, mentors, counselors, and friends. The Pace classroom is inspiring, interactive, and rewarding. Our Career Services team offers you one of the largest internship placement programs of any university in the New York metropolitan area. Each year, Pace facilitates more than 7,000 internships, co-ops, practicums, and field work experiences. We take career preparation seriously and offer you a variety of services beginning as early as your freshman year. Join a highly esteemed community of talented, hand-selected scholars and up-and-coming leaders studying under Pace University’s distinguished faculty. At the Honors College, you will thrive in an academic and social atmosphere where you, your peers, and your professors energize and challenge each other to realize your full potential. Advantages include unique honors courses, events, and advisement; research opportunities here and abroad; support for national scholarships and fellowships; and a $15,000 minimum annual scholarship, with a median scholarship award of $27,500. Pace University offers you the opportunity to spend a week, summer, semester, or year immersed in other cultures in order to gain a truly global perspective. Whether you’re interested in producing a documentary in a tropical location, studying European business in Berlin, or assessing ecosystems in Costa Rica, Pace can help you get there. There are more than 100 clubs and organizations for students to get involved in on our New York City and Westchester campuses. At our Westchester campus, Pace is host to 14 men’s and women’s NCAA Division II Northeast-10 Conference teams in basketball, baseball, cross-country, field hockey, football, lacrosse, soccer, swimming & diving, softball, and volleyball. We also feature intramural sports on both the New York City and Westchester campuses. Last year, more than $365 million in financial assistance was made available to students. Our financial aid packages include a combination of scholarships, grants, work-study funds, and federal loans. Use our Merit Scholarship Estimator to see how much merit aid you will receive from Pace at pace.edu/calculator.